I generally like to theme my posts. It also takes a while to formulate themes. After last years trip to Indonesia I ended up having a bunch of photos I wanted to post but couldn’t work them into a theme or couldn’t find the time to make enough posts to cover everything. As time passed photos seemed less relevant to where I was at the time (not that anyone would know, but I would know!) So, now that I have left Portland but still have photos I want to put out there I’ve decided to create a Photo Dump Post 🙂 I would prefer to call it a photo bomb post but photo bomb has a definition these days and would not be an appropriate word choice. I know, who cares? But that’s me, and it’s my blog. Unable to figure out transportation between the BoltBus stop and Budget Car Rental, I had to walk a mile and a half down a mostly uninspiring stretch of road. 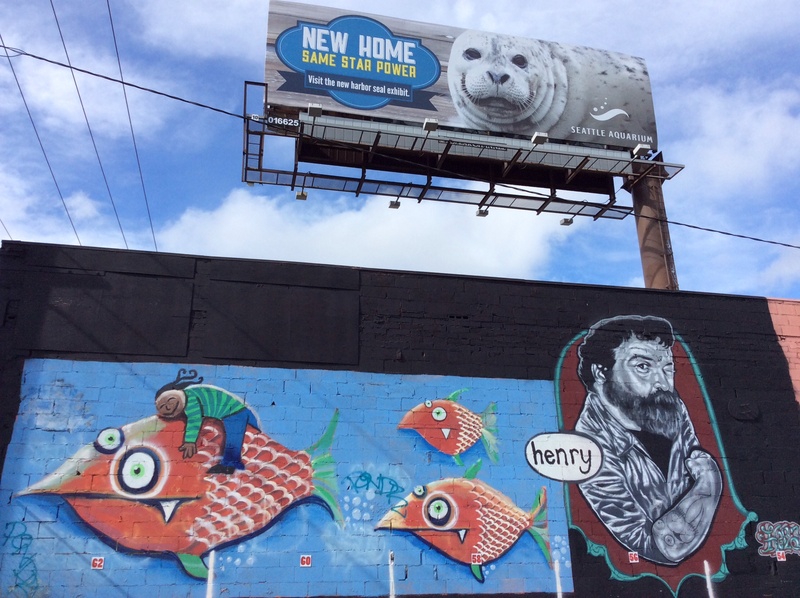 My reward was finding this painted wall and seeing harmony between it and the billboard above it. 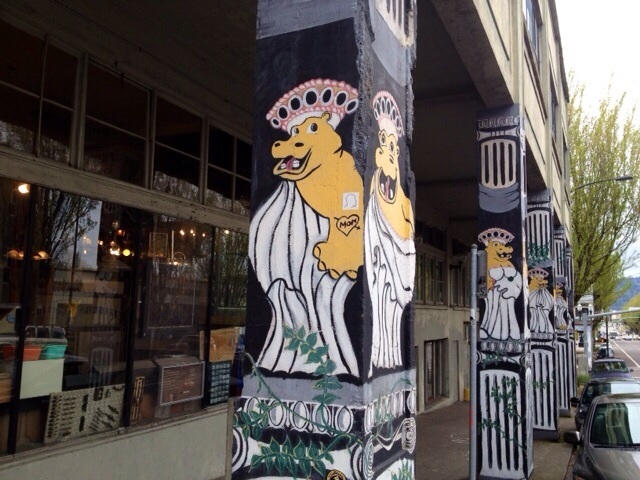 The column arcade outside Hippo Hardware. One more expression of Hippo Hardware. 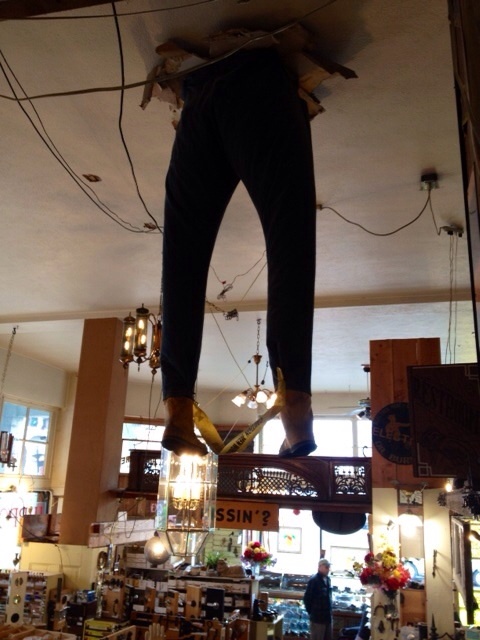 These legs are hanging out of the ceiling where you ascend steps to another level of the store. 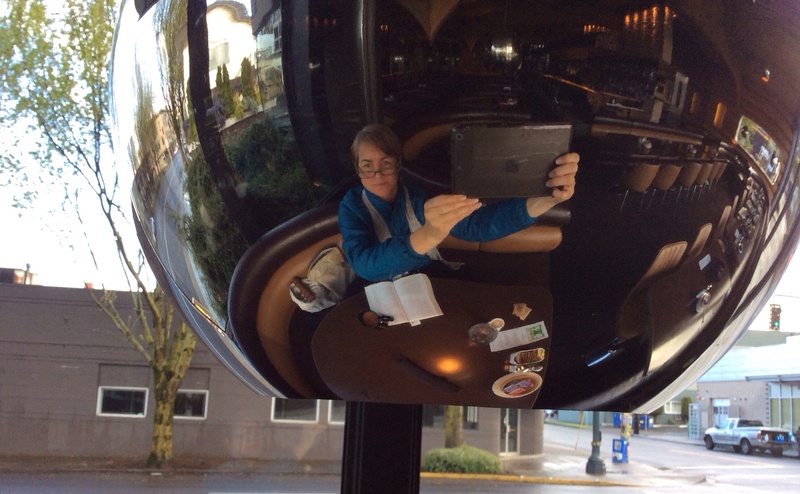 The restaurant at Jupiter Hotel provided a “selfie” option I was willing to take. I got a good dose of Portland weather variability: showers, sun, showers, cloudy but no rain, showers, mostly cloudy… Blue sky showed up the day I was leaving. 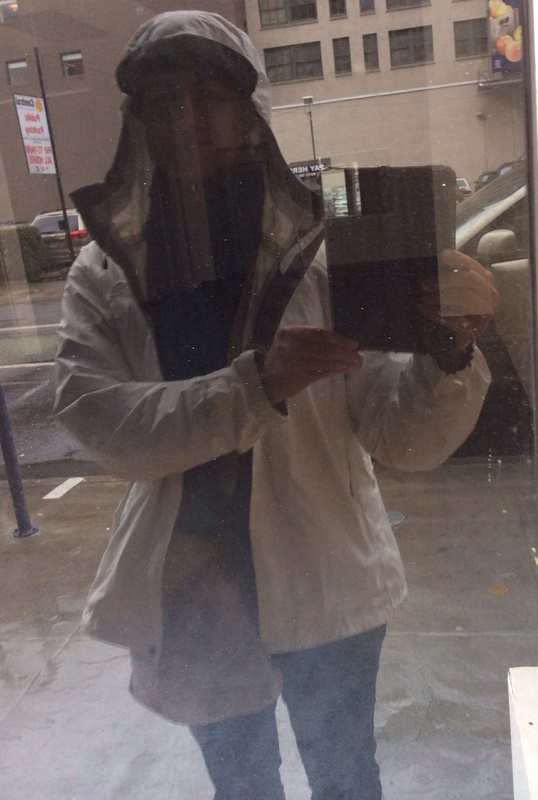 I have been living in my Patagonia Nano Puff for warmth, and my raincoat. They have been the perfect pairing. 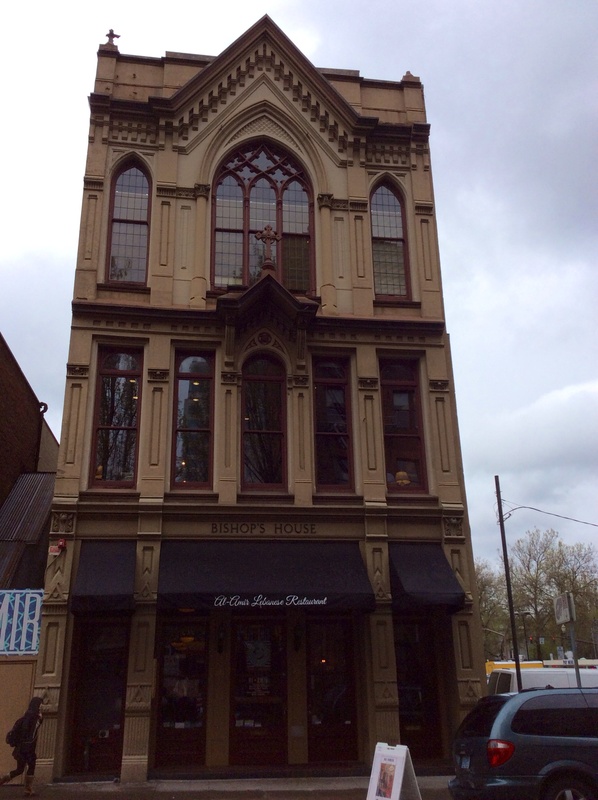 I saw this building across the street from Mother’s restaurant the night Carol Fanta took me there for dinner. It was dark so I couldn’t take a photograph. The next day after crossing the bridge to west Portland I realized I was just blocks from Mother’s again! Couldn’t pass it up. 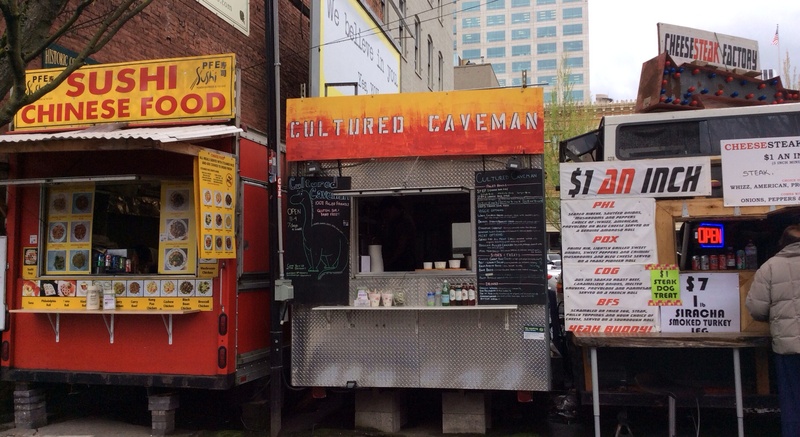 Food carts are everywhere. These are right next to Mother’s Bistro. 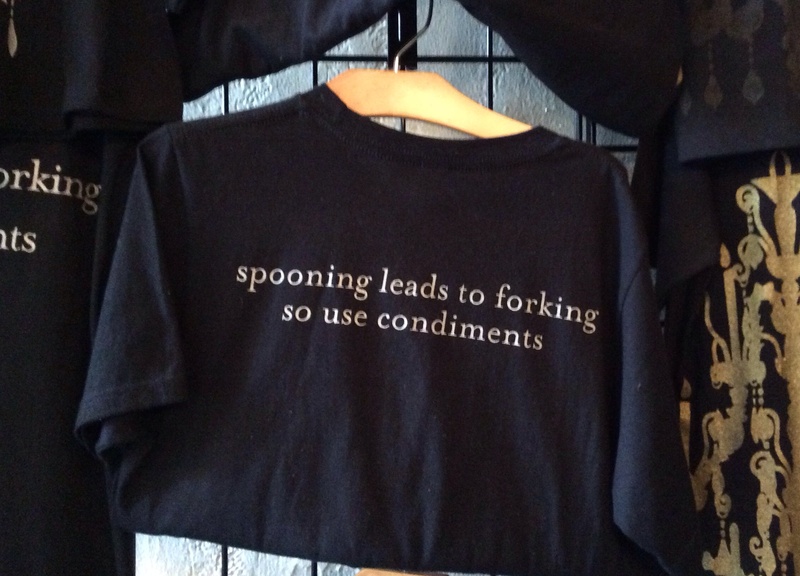 T-shirts for sale in Mother’s Bistro.